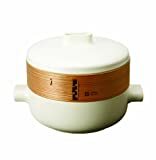 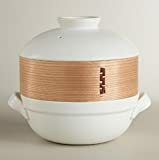 This cool new JIA Steamer Set updates the ancient bamboo steamer with a sleek modern ceramic pot / lid with a cedar wood and terra cotta steamer basket. 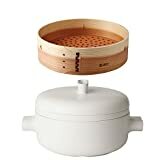 The natural terra cotta base of the steamer basket efficiently absorbs excess moisture to prevent soggy food, while the cedar wood walls release an appetizing aroma and the fireproof ceramic pot and lid has a higher heat resistance compared to stoneware and is much less likely to crack. 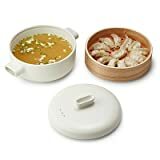 To use, fill the pot with a bit of water, place the steamer basket on top, insert vegetables, fish, and more, pop on the lid, and place on an open flame on your stove - it can take it along with the oven and microwave as well.